Flash mobs were once an amusing display of ostensibly sporadic choreography, but have quickly become a popular method to raise awareness of social issues. 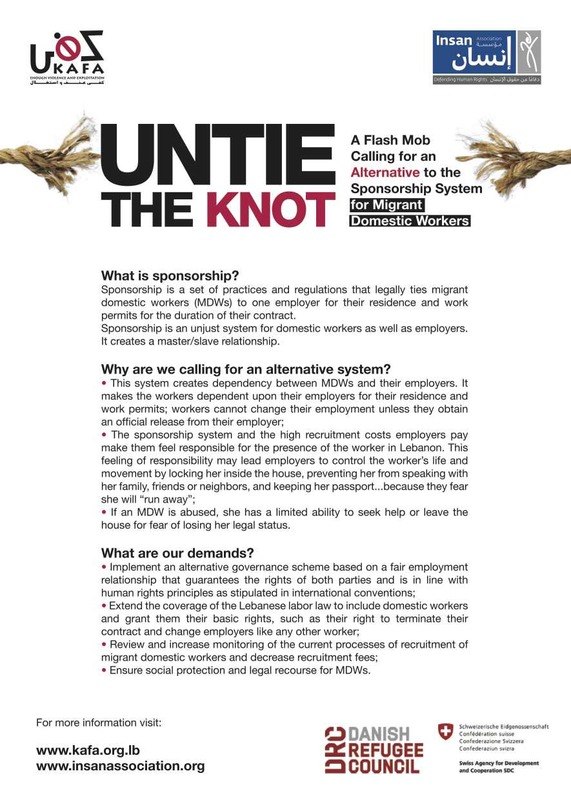 The Lebanese group KAFA recently organized flash demonstrations entitled "Untie the Knot" to highlight the plight of migrant domestic workers and to denounce the sponsorship system in particular. Below is an interview conducted with KAFA member Rola Abimourched. Established in 2005 by a group of multi-disciplinary professionals and human rights activists, KAFA (enough) Violence & Exploitation is a Lebanese non-profit, non-political, non-confessional civil society organization committed to achieving gender-equality and non-discrimination and to advancing the human rights of women and children. KAFA’s mission is to work towards eradicating all forms of violence and exploitation of women through advocacy for legal reform and changing of policies and practices, influencing public opinion, and empowering women through socio-legal services and support. What gave you the idea to launch a flash mob? How did you select the locations where you performed? Who was your main audience and what did you conceive as the its primary goal? Through our work we have identified the sponsorship system as one of the core problems and have published a policy paper on the alternatives to the sponsorship system. Using the recommendations of this paper as a base, we decided to focus on raising public awareness and advocating decision makers to push for an alternative. We also previously worked with migrant community activists and other civil society organizations on a Workers’ Day event calling for the end of the sponsorship. We wanted to step up our advocacy efforts but to do something different than a march or demonstration. So we decided on a flash mob with a dance that would illustrate the constraints of the sponsorship system. The flash mob was done in three locations in Jounieh and two places in Beirut. We picked the locations based on the crowds and also to try and target a diverse set of people. Our primary goal was to raise awareness on the issue of sponsorship to the public and to collect signatures showing support for an alternative to the sponsorship system. Another goal was to record the flash mob so that it can be seen by more people than those present in the locations chosen so that it can have a further reach. Our main audience was the Lebanese public. Who is involved in the video? Members of KAFA, community members, or both? The individuals who were part of the flash mob were migrant domestic workers who have been in Lebanon for a number of years and who are active in their communities and Lebanese volunteers. We have previously worked with these women to hold a parade and festival demanding the abolition of the sponsorship system for migrant domestic workers for Workers’ Day 2012. KAFA and Insan Association worked together to organize this flash mob. A number of people signing on to your banner. What did the banner say? 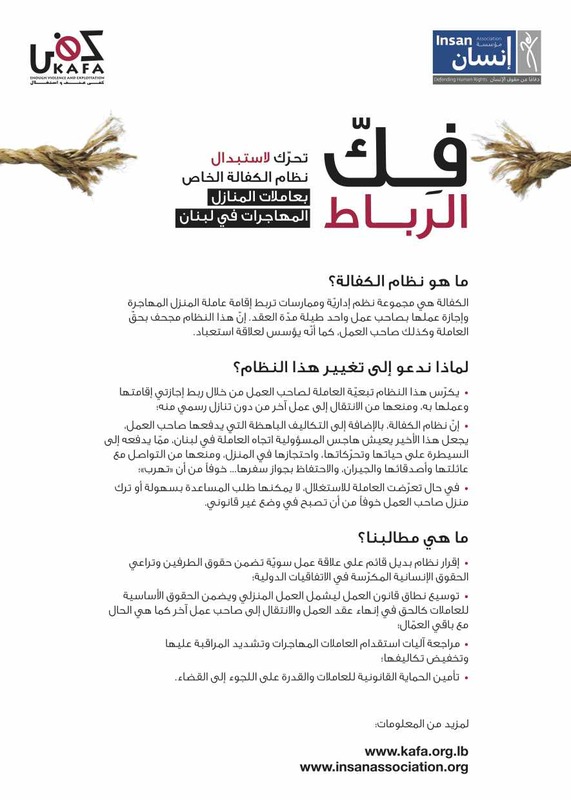 The poster said: With us to end slavery in Lebanon, with us to end the sponsorship system for migrant domestic workers. Do you think the demonstration was effective? It seemed to attract plenty of attention, which is the first step in raising awareness of the issues affecting migrant workers. I think the flash mob had an impact on the individuals who saw it could relate to the message that the sponsorship system ties workers to the employer. I was happy to see people signing the banner to show their support for an alternative to this system. Have you conducted similar social presentations in the past? Do you have plans for any more? KAFA conducted a flash mob before but it was focused on the pressuring members of Parliament to pass the draft law to protect women from family violence without distortions. We have previously organized with other civil organizations activities, such as marches and festivals during Workers’ Day to raise awareness on the situation of migrant domestic workers. We plan to continue to push for an alternative to the sponsorship system and we definitely have in mind to do other public activities to raise the issue.